Made in the USA, these crushproof and dustproof tough cases are designed with an automatic purge valve, that equalizes air pressure, a watertight silicone O-ring lid, over-molded rubber handles and stainless steel hardware. Made in the USA, these crushproof and dustproof tough cases are designed with an automatic purge valve that equalizes air pressure, a watertight silicone O-ring lid, over-molded rubber handles and stainless steel hardware. Made in the USA, these crushproof, dustproof and stackable cases are designed with an automatic purge valve that equalizes air pressure, a watertight silicone O-ring lid, over-molded rubber handles and stainless steel hardware. 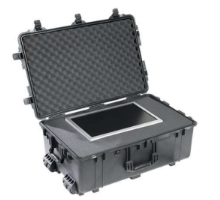 Guaranteed for life, The Pelican™ Storm Case™ has the same legendary DNA as all Pelican Protector Cases, but with a unique press and pull latch that locks automatically, and opens with a light touch. 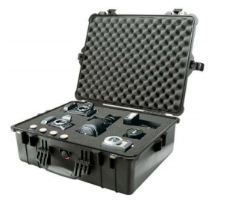 H2 Solutions Inc. is a Canadian distributor of Pelican products–including the 1550 Medium Case, 1600 Large Case, 1605 Air Case, 1630 Transport Case, 1650 Large Case, 1700 Long Case, and the IM3220 Long Case. Founded in 1976, Pelican provides durable, high performance protective cases, temperature controlled packaging solutions, advanced portable lighting systems and rugged gear for professionals and outdoor enthusiasts alike. Pelican's product line and company grew steadily over the years–offering a variety of protective solutions from its first product patent to its famous air cases, which are 40% lighter than standard Pelican Protector Cases yet retain their legendary toughness. As a firm strategy to diversity its products and service amongst the market, Pelican has created four distinct market divisions. Pelican's products are depended on by many professionals in the most demanding markets and industries including fire and safety, law enforcement, life sciences, defense and military, aerospace, entertainment, industrial and consumer.